5th March 2017: Tottenham Hotspur vs Everton and finally a chance to confess a football sin. The current ballot system at White Hart Lane has had me viewing our boys from all sorts of angles this season. Never before have I been so close to the action as I was when we took on Middlesbrough the other day, a few rows back in the East Lower with the action so close you could almost feel you were playing yourself. With Everton up at the weekend I have been allocated a ticket in the West Lower and have spent this week recalling the last time I was seated in this stand. Ironically against the same opposition but back some twenty-three years ago when again, ironically, our ground was being redeveloped and 24,533 of us crammed into WHL as the South stand was under development. It was 24th August 1994 in a crazy year that Spurs unveiled Jurgen Klinsmann to a sceptical football public as the spearhead of an attacking front-line dubbed the 'famous five'. The team constructed by Ossie Ardiles on the back of the 1994 World Cup seemed to have one philosophy, that we would score more goals in the opposition net than they would in ours, a brave strategy considering we started the season with a six point deduction, but in Ossie we trusted. My reward for attending that night was a memory that will stay with me forever. Klinsmann, on his home debut, volleying an overhead strike and running to my section of the West stand to celebrate with a cheeky dive to add to the entertainment. Anyone who witnessed it, will never forget that moment. The twenty-four thousand that left WHL that night, a 2-1 victory with Klinsmann scoring both, thought this was finally going to be our season, we had a feeling of hope that we hadn’t had for a number of years. Now, a proper football writer would open up the debate of why, with such an attacking threat back in 1994, did Spurs once again fail to compete and challenge for the title. How did that side compare with today’s exciting team? What did Ossie get so wrong compared to Mauricio when he had Sheringham, Klinsmann, Dumitrescu, Barmby and Anderton up front. To complement that attacking threat we also had Gary Mabbutt and 'he who should not be mentioned' at the back, as well as an international goalkeeper in Walker between the sticks. Sadly you will have to debate this amongst yourselves or save it for another day, I'm not that sort of writer, and I'm going to use this article to try once and for all to banish a memory that always surfaces when we play Everton, it is a far more troubling event than the disappointment of the 94-95 side, it resurfaced that night 23 years ago, it comes and goes over the years and will certainly be back on Sunday when we take on the toffees again. What is about to follow is a confession that will shock those who know me and has never been passed on to anyone before. It will, I'm sure, stand as a vital lesson on how decisions we make shape our lives and affect our memories when we contemplate them in later life. My confession, as you will discover, could have placed me not in the West stand on Sunday or twenty-three years ago…it could have had me in the away end!! Growing up in the seventies, which was not a great era for the spurs, you would have thought that handling defeat was something I grew up with and became accustomed to. Let’s face it, we even suffered the shame of dropping to Division Two towards the end of the decade. Yet I could in those days become very upset if another weekend ended without points or an exit from a cup competition. My parents would gladly have told you how their nine year old boy was someone to avoid on a Saturday afternoon if things hadn’t gone the Spurs way. 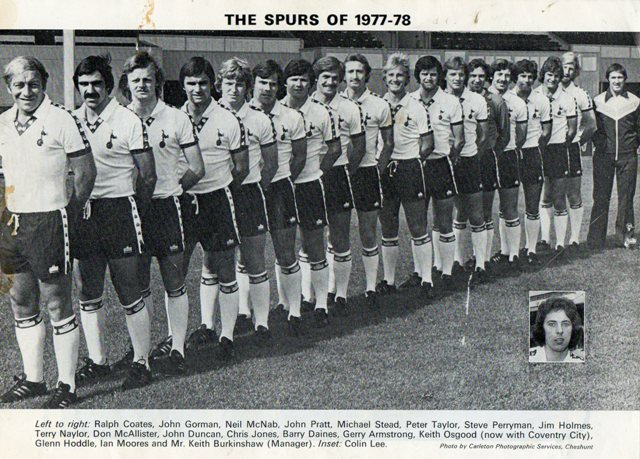 On this particular Saturday, 26th November 1977 to be exact, with the Spurs in Division Two, I vividly remember returning to my bedroom after a 0-1 defeat at Bolton and having been informed via Teletext, I saw my blue and white scarf hanging miserably over my bed post and for some reason I realised it was the same as the colours of the Merseyside team we are about to meet this weekend. Now, before I go any further, please bear in mind that I have never mentioned this to anyone, don’t judge me, just be pleased by the power of this article that my forty year secret is out, that I can return to normal life without this burden and that you have all helped. With Everton bearing exactly the colours I needed to make a transition of allegiance, I there and then decided to change and walk away from the Lillywhites. It was my father’s fault anyway I was stuck with Spurs, for no real apparent reason and the upside was I wouldn’t have to suffer weekend misery or buy a new scarf. Everton were doing much better and having consulted my Panini sticker book I noticed I had already collected more Everton players and that they boasted more stars than the Spurs team of the seventies. In my mind the deed was done and all that remained was the long walk downstairs to inform my father that our joint love affair with the Spurs was over. It was at this moment that the football gods intervened, my father arrives home from work as I enter the front room, he opens his work bag and produces from it a Stoke City v Tottenham Hotspur programme and declares it’s for me. A work colleague had attended the game from a few weeks ago, purchased the programme for me and had put the icing on the cake by collecting a number of autographs from the Spurs team. This was the best thing I had ever had, all thoughts of a switch disappeared and I spent a happy evening with my father discussing every part of the programme as well as optimistically predicting a win the following weekend against Southampton. And so, on such events life changes, if the programme hadn’t arrived, would I today be supporting Everton? Sure, the Eighties might have been fun, but nothing can replace my Spurs memories. Later in that fateful season in which everything could have changed my mum took me to my first live game, Bristol Rovers away, from there I would need another article to list some of the highlights and lowlights of my career supporting Tottenham Hotspur Football club. The team that I so desperately wanted 40 years ago will be out on the park this weekend and I know from my West stand viewpoint that whatever happens in the game, I will be at the right end, always will be and any young supporters reading this should take this tale as confirmation, that however your team are doing now, at some stage they will come good, keep the faith. Now that is over, any of you still wishing to have that debate comparing the team of 1994 to the current squad may well be interested in some further research into the past I have conducted this week. A glance at the programme for the 1994 game has already given me a clue as to why the 94 team failed so miserably. Our friend Ossie, instead of installing a Victor Wanyama to sit behind his famous five, chose one Jason Dozzell to hold the midfield, need I say more.